As environmental issues continue to be crucial, fashion brands are striving to adopt more sustainable production practices. H&M, one of the world’s most influential fast fashion brands, has participated in numerous environmental initiatives over the years, including the Ellen McArthur Foundation‘s global commitment to reduce plastic pollution. The brand also launched an eco-friendly line in 2012 and an eco-friendly denim collection for Spring 2018. 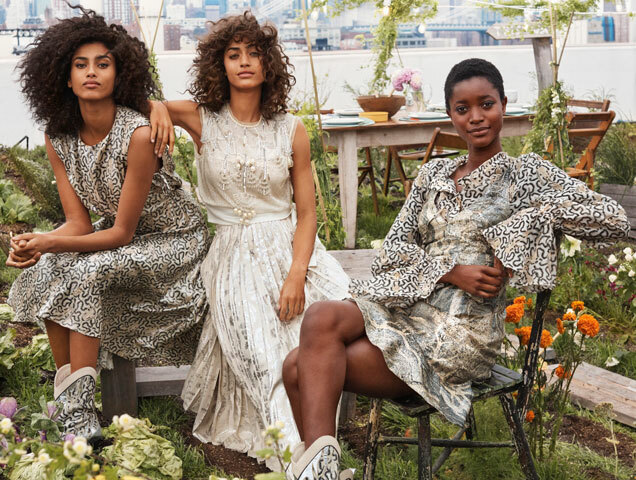 Now, as part of its sustainability efforts, H&M is launching the Conscious Exclusive collection for Spring 2019. “For this collection, we explored the beauty in nature, which shows in the prints, as well as the flowy silhouettes, the striking color palette and the attention to detail. We’re thrilled to introduce new plant-based sustainable materials to create high-performing, beautiful and fashionable pieces that are statement-making yet so easy to wear,” creative advisor Ann-Sofie Johansson said in a press release. Inspired by nature, the Conscious Exclusive collection includes pantsuits, dresses and shorts in soft, feminine silhouettes perfect for all occasions. The pieces are made with innovative sustainable materials including a natural leather alternative made from cellulose fibers extracted from pineapple leaves, a plant-based flexible foam using algae biomass and sustainable silk-like fabrics made from citrus juice by-products. Other materials used include recycled polyester, organic cotton, organic linen, organic silk, TENCEL™ lyocell, recycled plastic, recycled glass and recycled silver. The collection, priced between $24.99 and $299.99, is set to launch online and in stores on April 11. For now, you can start selecting your favorite pieces and preview the collection at hm.com.